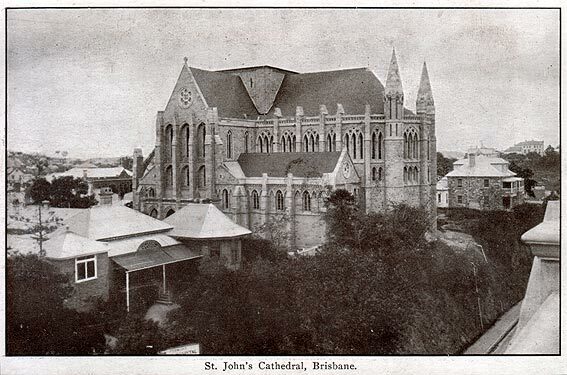 The foundation stone of St John's Cathedral was laid in 1901, and the first portion of the building (comprising the sanctuary, chapels, transepts and two bays of the nave) was consecrated in 1910. 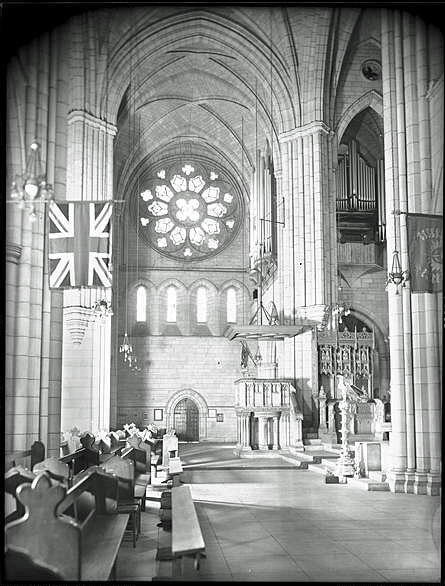 The architect, John L. Pearson, who had recently designed the new Truro Cathedral in Cornwall, had been chosen by Bishop Webber, for whom he had also designed a church in London. 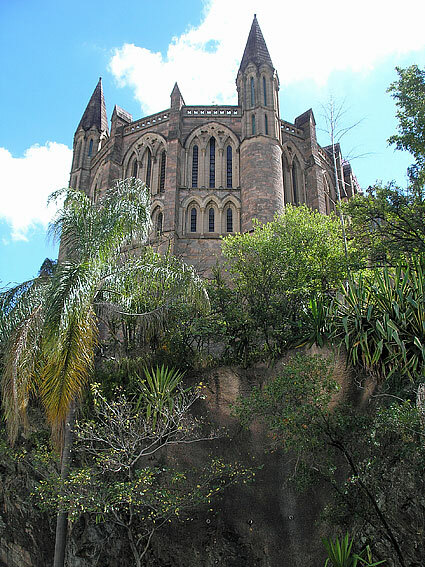 John Pearson's son Frank continued the work his father began.1 The building is in Early English Gothic style, with many characteristics of French Gothic, built largely in local stone: external coursed rubble of porphyry, and internal freestone dressings of brown Helidon sandstone. From 1910 until the mid 1960s, the building remained much as it was opened. The east end, comprising the sanctuary, side chapels and transepts, adjoined just two bays of the nave with a temporary west wall. 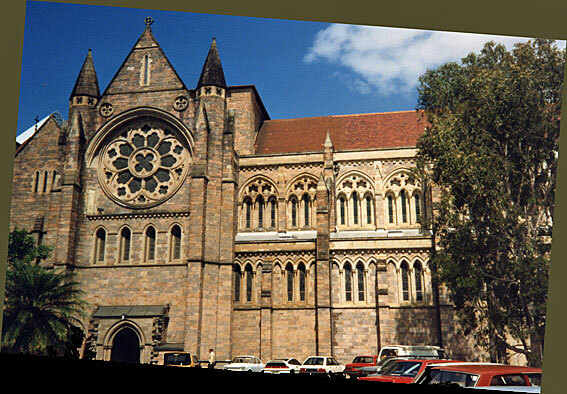 The second phase of the building, comprising an extension of a further four bays to the nave, was commenced in 1965 and consecrated in 1968 by Archbishop Philip Strong. Again, a temporary west wall was constructed. 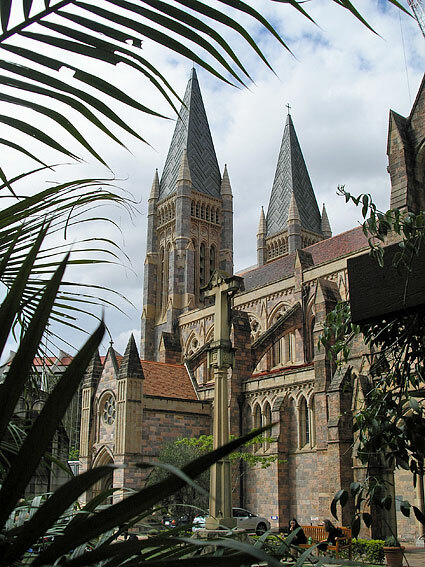 The final phase of construction commenced in 1989, comprising the completion of the nave, construction of the south-west porch and west front, addition of the north and south towers, completion of the central tower, and the addition of the three spires. 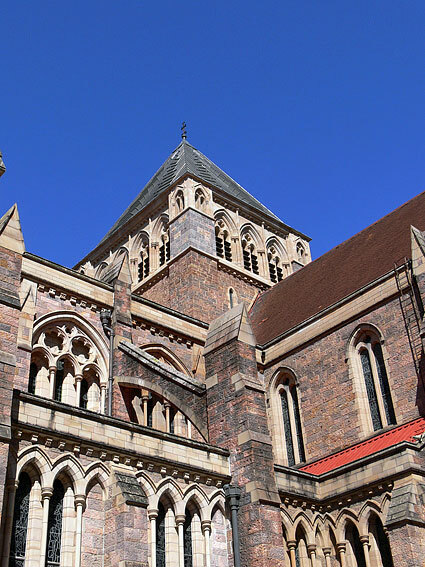 The completed building was consecrated by Archbishop Phillip Aspinall in October 2009. A suitable electric motor and Kinetic Blower to be supplied for the first portion of the organ. External casework not included in this estimate. Front pipes silvered with aluminium. Some confusion remains concerning the date of the Swell Double Diapason addition. 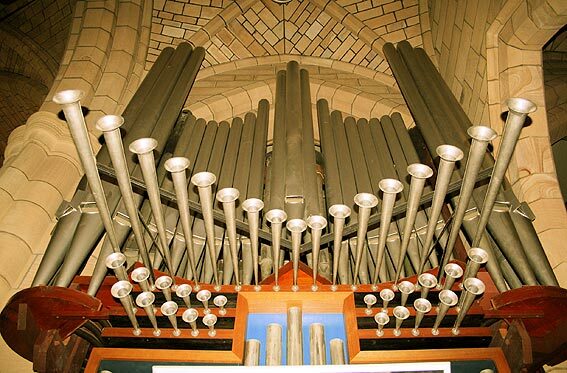 A stop described in the Norman & Beard records as "Swell 16ft Double Diapason" was shipped from England in June 1915, but it was described as the new "Swell Bourdon stop" presented by Mrs N. Congeau when used at a recital in the Cathedral on Monday 11 October 1915.8 A Swell Bourdon 16ft was also recorded on the old console as one of the 1924 additions, which marked the centenary of the City of Brisbane. A letter concerning the Swell Double Diapason from B.B.Whitehouse & Co. to Norman & Beard in 1915 included the statement "We take it that you will use metal as far down as advisable, as the wood pipes are dutiable. 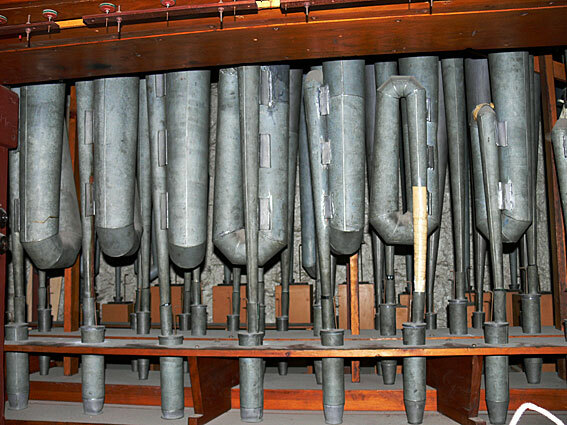 "10 It appears, therefore, that the upper (metal) registers of the original Swell Double Diapason may have been transferred to the Great as a Double Diapason in 1924, at which time both stops were completed. The Pedal Violone added in 1924 was borrowed from the Great Double Diapason, although this had not been the original intention. 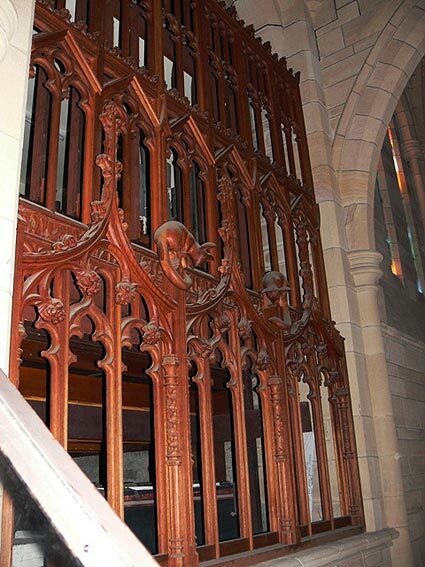 Pipes for these two stops are contained in the north-transept casework. 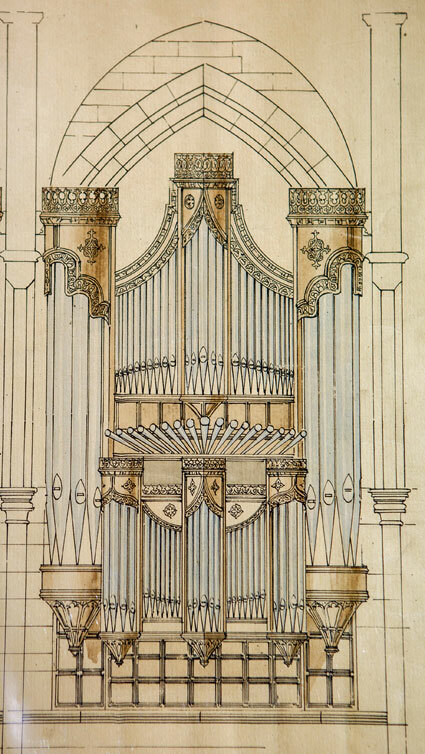 (A) The whole scheme of the organ to be full cathedral scale and designed for a large and lofty building. (B) The Diapason work to be especially full and mellow. Stops 2 and 3 on Great are too often of much too equal strength. 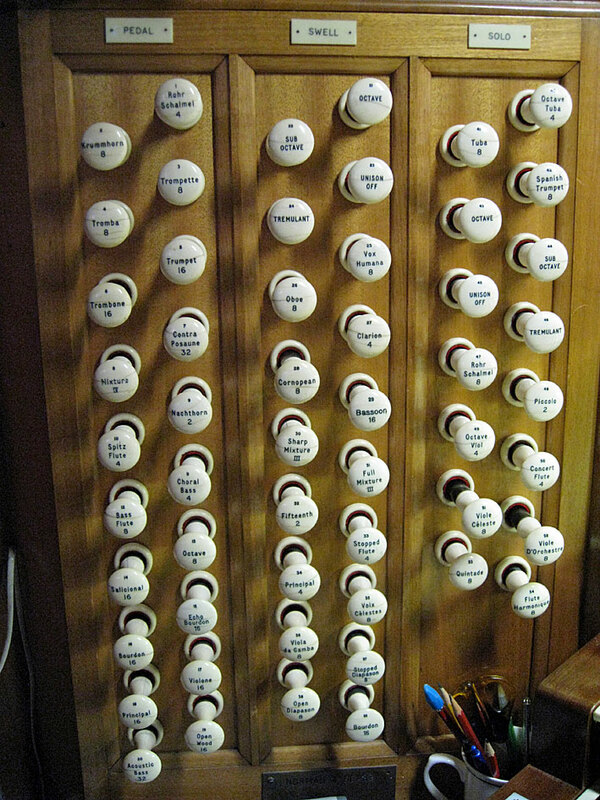 (C) All these stops Great Nos 8, 9, 10, Swell 21, 22, Choir 36, are in most English organs of far too rasping and harsh a character. I shall be delighted if you can get the same strength without the usual piercing harshness. (D) Swell Box. . . . I trust that I shall get an absolute PPP when closed on both Swell and Choir . . .
(E) The Pedal Bourdon to be soft enough quality to accompany the softest stops in the Swell. (F) The Open Diapason wood cannot be too full or weighty. (G) The tremulant. Messrs. Whitehouse will write regarding this. (I) Reeds. The quality of the reeds must not be too smooth. On all except the Oboe I want Trumpet tone not Horn or Cornet tone. (J) Lever Pedal to Swell and Choir. 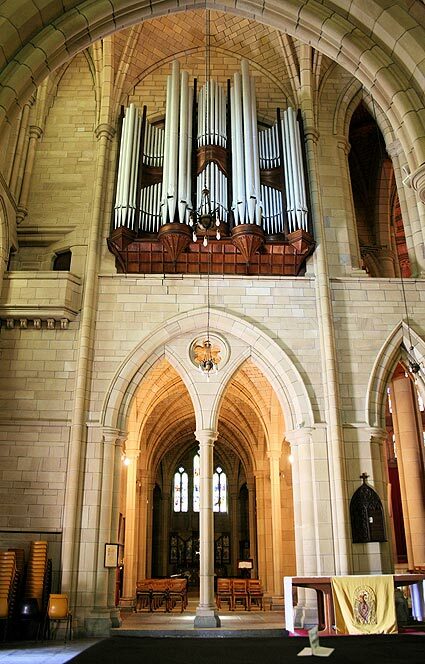 The organ was officially re-dedicated on Sunday 18 June 1972 in its enlarged and rebuilt form. 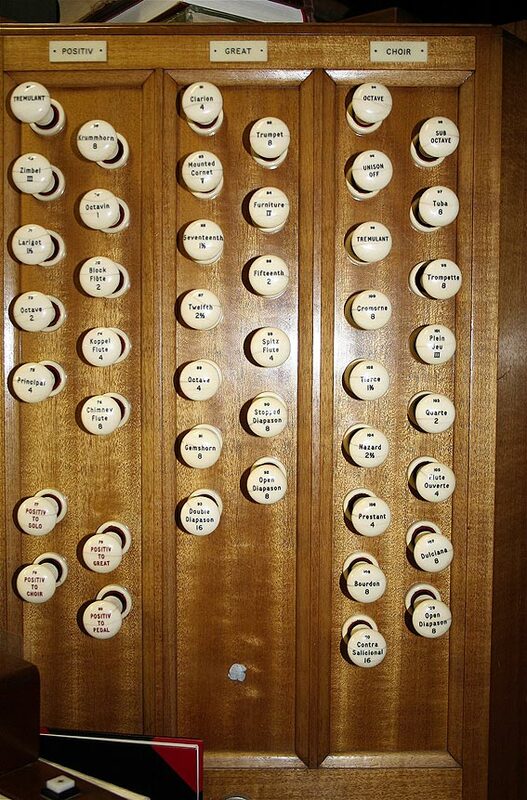 With the addition of a Positiv Organ in the former location of the organ console, a swallows nest was extended out below the organ chamber and above the ambulatory to accommodate the new console. 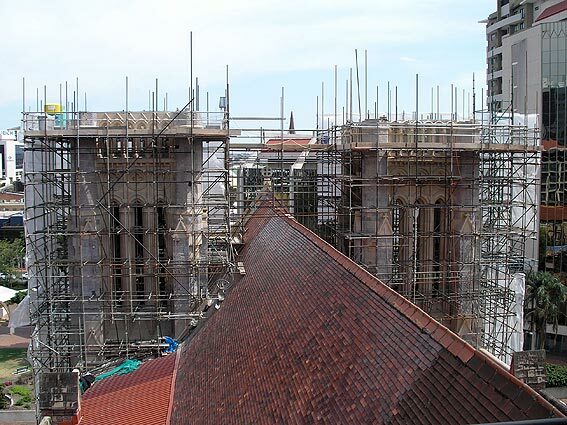 The outer towers of the sanctuary façade were raised significantly to accommodate the new Positiv Organ and to allow access to the lowered console. 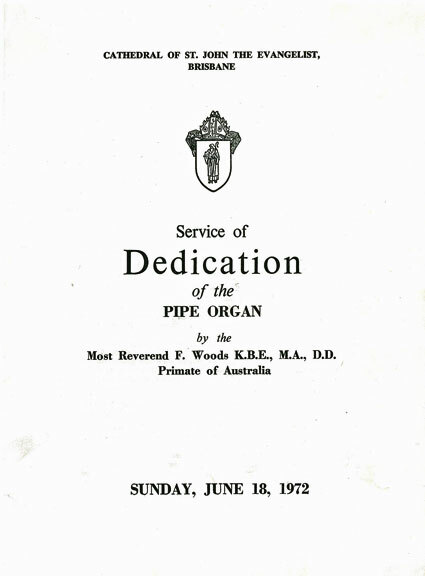 The conceptual framework for rebuilding the organ in 1970-72 was that of providing a versatile instrument capable of playing repertoire from a variety of schools and periods. 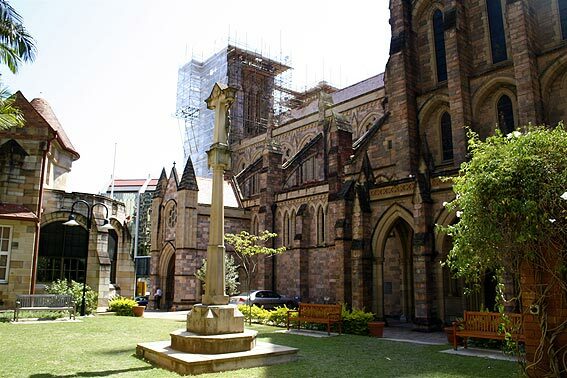 At that time in Brisbane, there were no modern mechanical-action organs, and the imperatives followed were those evident in major rebuilds elsewhere by Hill, Norman & Beard. Much of the original pipework was revoiced, and wind pressures were generally lowered. 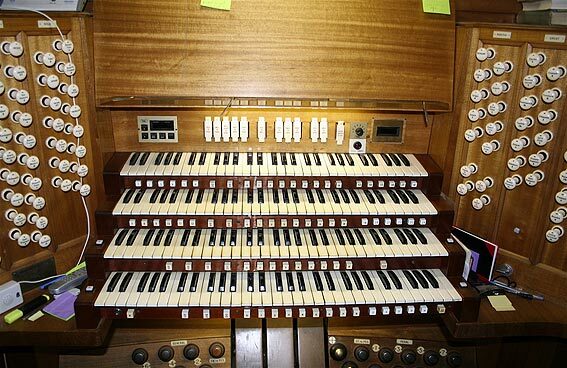 The former Great Open Diapason No 1 was redeployed on the Pedal Organ, the former Great Principal 4ft and Fifteenth 2ft were replaced by new stops, and several stops were moved between divisions. 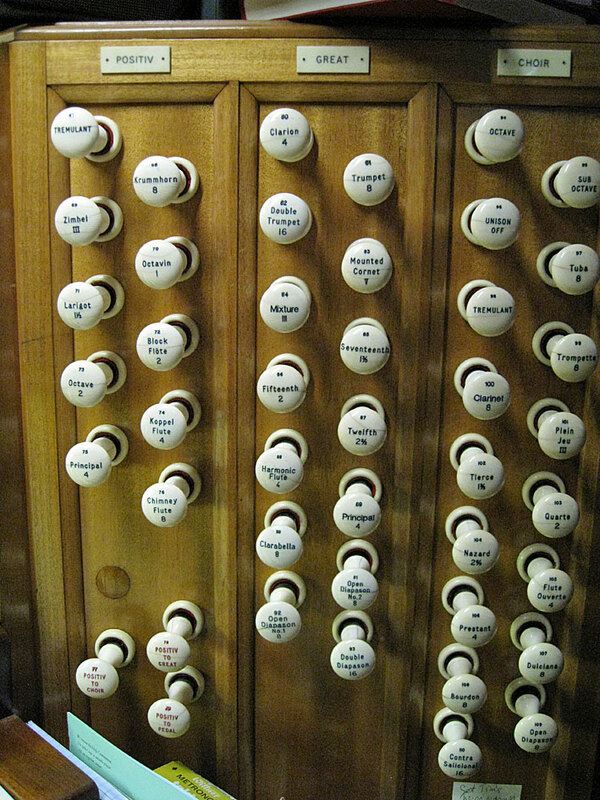 The two 8ft string stops on the Solo Organ were reported to have come from the organ of Gloucester Cathedral in England, which was rebuilt around the same time.16 If the report is correct, they had been added to the Gloucester organ in 1920 by Harrison & Harrison,17 but Simon Pierce has noted that the string stops on the Solo Organ in Brisbane are of composite pipework, possibly incorporating some pipes from the original Swell Dulciana. 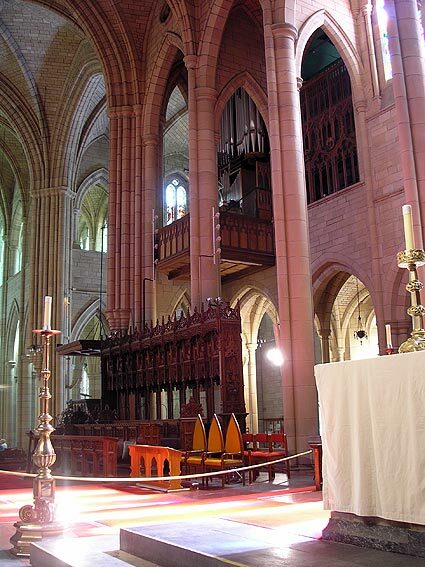 Following the re-opening of the organ in 1972, recital series by Robert Boughen at the Cathedral included the complete organ works of Bach (twice), Messiaen, Buxtehude, Brahms, Franck, Howells, Liszt, Mozart and Mendelssohn.19 The rebuilt instrument served from this time to inspire several generations of young organists who had not otherwise had the opportunity to perform the wide repertoire of the organ on such a versatile instrument. 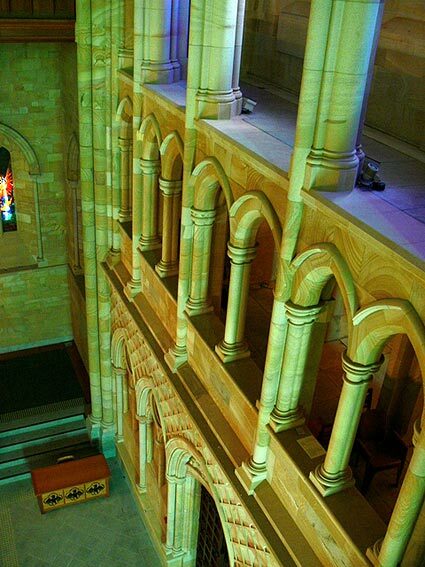 With the completion and enlargement of the Cathedral, the instrument was found to lack the necessary projection of sound. Under the direction of Rev. 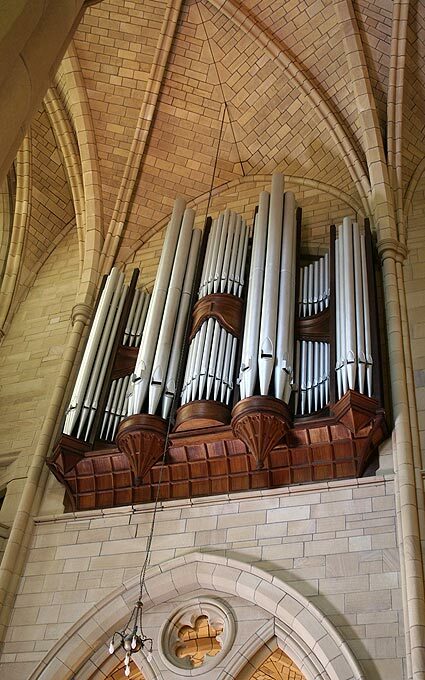 Rupert Jeffcoat (organist of the Cathedral from 2005 to 2010), Simon Pierce sought to restore something of the character of the 1909 instrument, whilst working within the general scope of the 1972 specification. Wind pressures were generally raised, existing pipework was revoiced to suit the higher pressures, and some stops that had been moved between divisions in 1972 were returned to their original location.22 Four of the 1972 stops (Gt. Gemshorn 8ft; Gt. Spitz Flute 4ft; Sw. Spitz Flute 8ft; Ch. 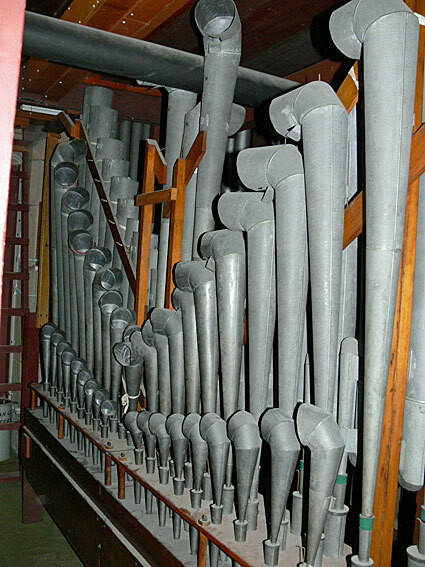 Trompette 8ft), were deleted to make way for five new stops (as listed below) that better serve the restored 1909 character of the organ. 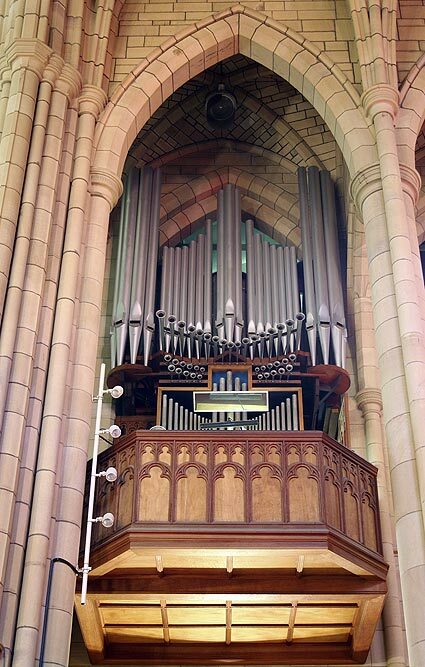 The organ suffered water damage during a freak storm on 27 November 2014.25 A small two-manual Laukhuff organ, originally located at St James' Anglican Church, Kelvin Grove, was installed in the Cathedral in 2016 on a temporary basis, pending repairs to the main organ. 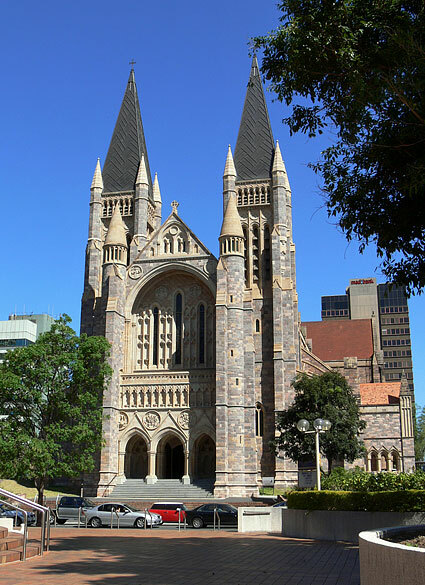 1 J. Donald Bleakley, Guide to St John's Cathedral, Brisbane (Brisbane, 1969). 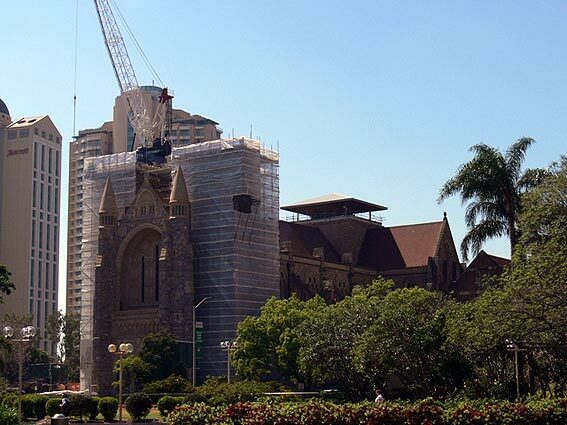 2 Queensland Heritage Council, Queensland Heritage Register, location 600076; The Heritage of Australia: The Illustrated Register of the National Estate (South Melbourne: Macmillan, 1981), 4/12. 3 The Brisbane Courier (8 January 1909), p. 5. 4 The Brisbane Courier (29 October 1910), pp. 5, 6; The Queenslander (31 October 1910), p. 37. 5 The Brisbane Courier (30 November 1910), p. 2. 6 Specification for Order Number 999 in Norman & Beard Order Book (3 February 1909), supplied by S. Forder (Director and Secretary, Hill Norman & Beard, London) to Geoffrey Cox, 1974. 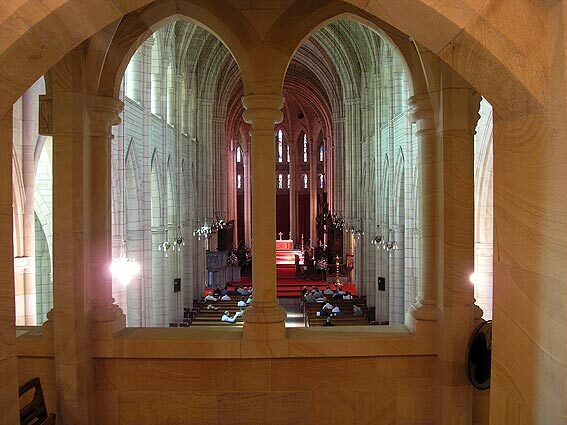 Details of additions [in square brackets] noted at the old console agree substantially with those given in George Sampson, 'The Music at St. John's Cathedral from 1898 to 1935,' Brisbane Cathedral Notes, vol. 19, no. 242 (1 Oct 1935), pp. 133-34, although Sampson states that only 19 stops remained to be added, and does not list the Choir/Solo Orchestral Oboe as 'still required'. 7 Details from plaques on the original console, noted by G. Cox, c.1972; Details of Norman & Beard invoices 11715, 12065 and 12572 to Messrs B.B.Whitehouse & Co., supplied by S. Forder (Director and Secretary, Hill Norman & Beard, London) to Geoffrey Cox, 1974; Brisbane Cathedral Notes, cited by Robert Boughen, c.1974; The Brisbane Courier (1 March 1913), p. 16. 8 Norman & Beard Invoice 12990 to Messrs B.B.Whitehouse & Co. (21 June 1915), supplied by S. Forder (Director and Secretary, Hill Norman & Beard, London) to Geoffrey Cox, 1974; Brisbane Cathedral Notes, cited by Robert Boughen, c.1974. 9 Whitehouse Bros Ledger (1922-1940), p. 79. 10 Letter dated 30 April 1915 from B.B. Whitehouse & Co. to Norman & Beard, supplied by S. Forder (Director and Secretary, Hill Norman & Beard, London) to Geoffrey Cox, 1974. 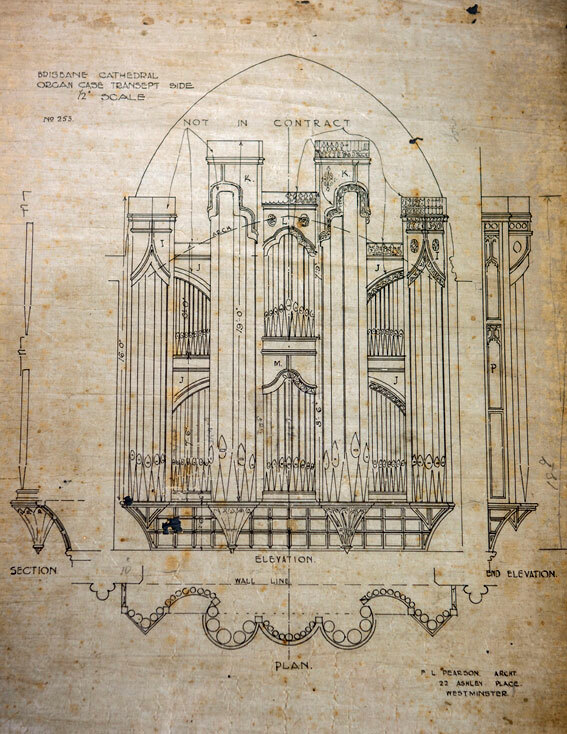 11 Denzil Scrivens, 'The Organ of St John's Cathedral, Brisbane: The Rediscovery of the Organ Case Designs,' OHTA News, vol. 40, no. 3 (July 2016), pp. 16-23. 12 Letter dated 26 December 1908 from George Sampson to Norman & Beard, supplied by S. Forder (Director and Secretary, Hill Norman & Beard, London) to Geoffrey Cox, 1974. 13 Hill, Norman & Beard Order nos Q793, 867 & 877, noted in OHTA News, vol. 14, no. 2 (April 1990), pp. 27, 29. 14 Date supplied by Dr R.K. Boughen (Cathedral Organist 1960-2004) in personal communication to G. Cox, November 2004. 15 Undated newspaper clipping, late 1971 or early 1972, supplied by John Maidment. 16 S.J. 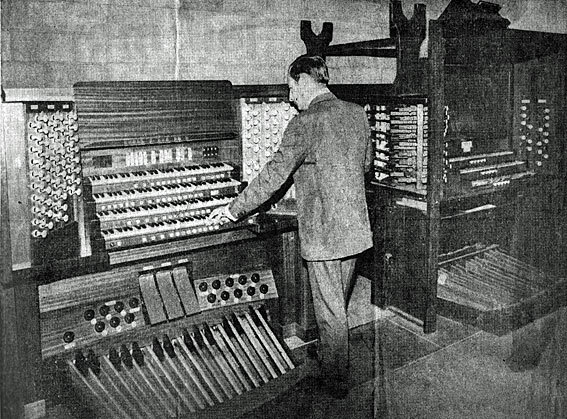 Webb, 'The rebuilt Gloucester Organ,' The Musical Times, vol. 112 (1971), p. 799. 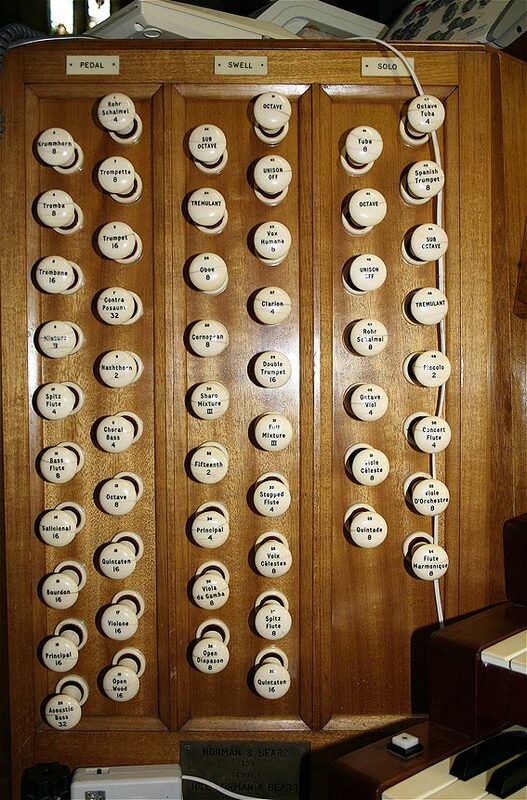 17 The Organs and Organists of Gloucester Cathedral (Friends of Gloucester Cathedral, c.1972), pp. 17-19. 18 Specification noted by G. Cox, 1972. 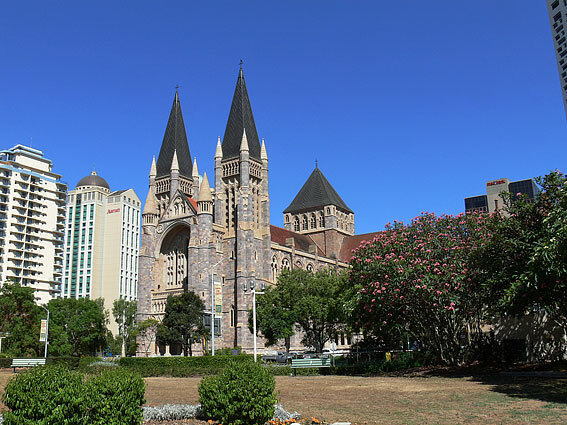 19 Biographical notes provided for a recital at Brisbane City Hall during the 30th Annual Conference of OHTA (30 September 2007). 20 The Organ Voice, vol. 19, no. 3 (December 1991), p. 56. 21 Personal communication to G. Cox from W.J. Simon Pierce, August 2008. 22 Interim reports were provided in OHTA News, vol. 33, no. 1 (January 2009), p. 10, and in Organ Australia, vol. 5, no. 3 (September 2009), pp. 8-9. 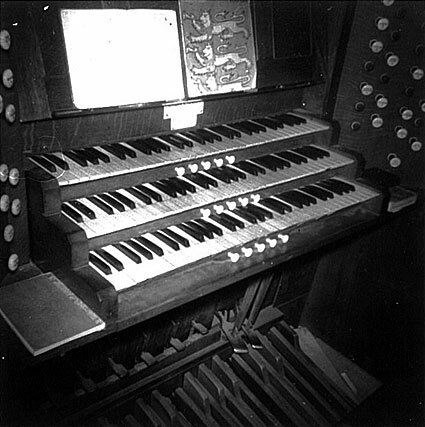 23 David Vann, 'An Organ Ramble to St John's Cathedral, Brisbane,' Organ Australia, vol. 7, no. 1 (January 2011), pp. 14-17. 24 Specification noted by Geoffrey Cox, July 2011, with details of changes provided by Simon Pierce. 25 Personal communication to G. Cox from W.J. Simon Pierce, November 2014.